The radical changes occurring in the global business environment, that is, in the information technology field and in management practices, call for a general rethinking of firms strategic positioning and competition. In this scenario, firms having the capacity to manage all of their own intellectual assets seem to be the only way to survive and succeed. The ability to comprehend the role that customers can play in contributing to a firm’s value creation is one of the main elements behind the growing attention of researchers and managers in context to managing a firm’s relationship with customers. 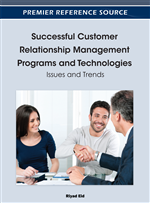 This paper highlights the relevance of a Customers Relationship Management (CRM) issue in a Knowledge Management perspective as well as in Relational Marketing. In addition, this study shows how the rising and large adoption of Web 2.0 technologies represents a real opportunity for the effective implementation of a CRM strategy. In a context characterized by uncertainty and continuous changes, organizations are required to behave as open systems able to benefit of the multitude of exchange processes and interactions with the social environment in which they are embedded. In this perspective, organizational reality is the result of the interaction of its members who must develop a joint interpretation. The knowledge of the organization results from former experiences in the enacted system and allows the development of common images (Argyris, 1964), collective minds, shared interpretation systems and mental models (Senge, 1990).